A great value, this Air Force One Greeting Card is uniquely coupled with a high quality, lapel pin featuring the official emblem of Air Force One: The Final Mission. The attached Air Force One Lapel Pin is hand made of polished solid brass and hand laid cloisonné. The exclusive photos by the authors are combined with the official Air Force One: The Final Mission emblem. 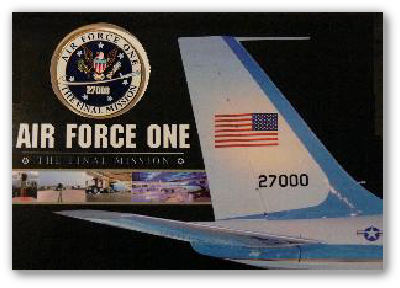 The Air Force One greeting card is a large format gift card is printed on heavy stock and finished with a high gloss UV coating. Measuring 4.5” X 6”, the card features the tail section of this aircraft bearing “Old Glory” and the most famous tail number in aviation history, and a short photo history of Air Force One. The cards are blank inside for your personal message or to simply be displayed on a shelf. The Air Force One greeting card makes a great gift and they are suitable for framing.